Internet Marketing - Does Star-Telegram.com Even Care? Internet Marketing – Does Star-Telegram.com Even Care? Update: 2015 – This post has been sitting as a draft in my Dashboard for 2 years.. I decided to edit it a bit and publish. All content still relevant.. Typos/grammar = Love. Enjoy. If you live in DFW area there is no doubt that you have heard of the Star-Telegram. It is a great source of local news and is owned by the second largest newspaper company in the United States (McClatchy). We all know how subscription based printed media has struggling the last 5+ years. Due to this issue, companies like McClatcy look to use their online presence to make up this loss in revenue. This is great, I just believe the way Star-Telegram.com is trying to make money online could be accomplished in a smarter, more effective way for both the company and for their online visitors. This post is going to go over how I personally would run the digital marketing and position the Star-Telegram web presence to bring in more revenue and increase traffic without all the ads you are currently bombarded with. Lets first start with the overall goal of Star-Telegram. What do you think the goal of Star-Telegram.com is? I would say the the goal of Star-Telegram is to make money and second, serve local news. Star-Telegram would probably say that previous, but you know..
You see this in action when landing on the homepage of the Star-Telegram and browsing through a few pages. To tell you the truth, it is overwhelming with ads. 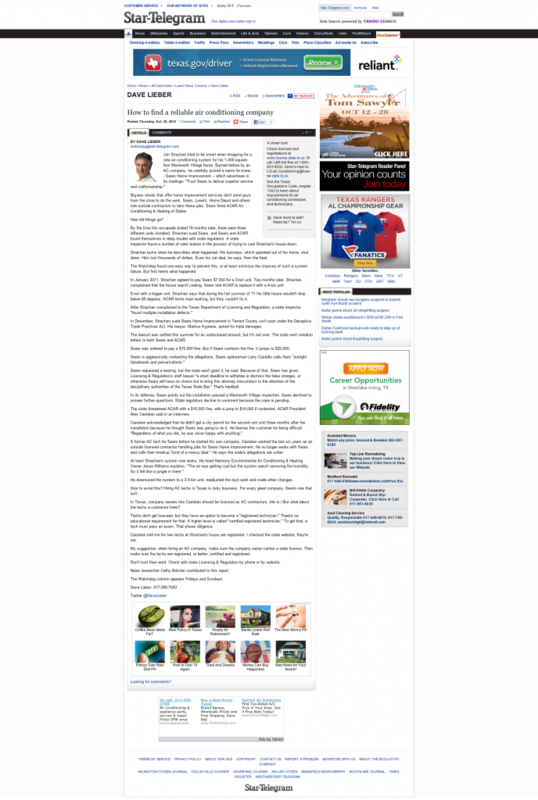 Go to any major news source or blog, you rarely ever see the corner page fold ads or ads that take over the whole page. Nowadays interstitial ads are also frowned upon, unless of course your only concern is making money. Before we go any farther, I just want to say I love the Star-Telegram, I just think we can all learn something analyzing their current strategy. Ads – This one is obvious.. If you click on any of the ads on Star-Telegram.com they get paid per click (PPC) or by cost per impression (CPM). Marketplace – This could be selling a one-off product or subscription based model. Affilate Marketing – Promote a service/product and get a commission of every sale. Sponsors – A company/business could sponsor a page, article, event. Paid Content – A members only section with exclusive content. Job Boards/Classifieds – Get paid per listing or job posting. Email Lists – Build and market to individuals on an email list. Promoted Content – This could be sponsored posts, external widgets, links, etc. These are some of the more popular ways to monetize website traffic, I am sure the sticklers out there can list a few hundred more.. Just trying to illustrate there are other ways to generate income other than just ads. Lets go over what it looks like Star-Telegram is doing to monetize their site. Ads – These are everywhere.. sidebar, header, footer, floating, popping, etc.. You can also pay for advertising on their network of sites and printed material. Affiliate Marketing/Promoted Content – The site has a dealsaver.com widget that could be PPC or commission based. Also includes a widget below articles and other third party services. Legacy.com, AdPrefect.com, Findnsave.com, etc. Job Boards/Classifieds – They are a newspaper, so of course they have a classifieds section and job section. The job section is powered by CareerBuilder and most likely using their affiliate program. 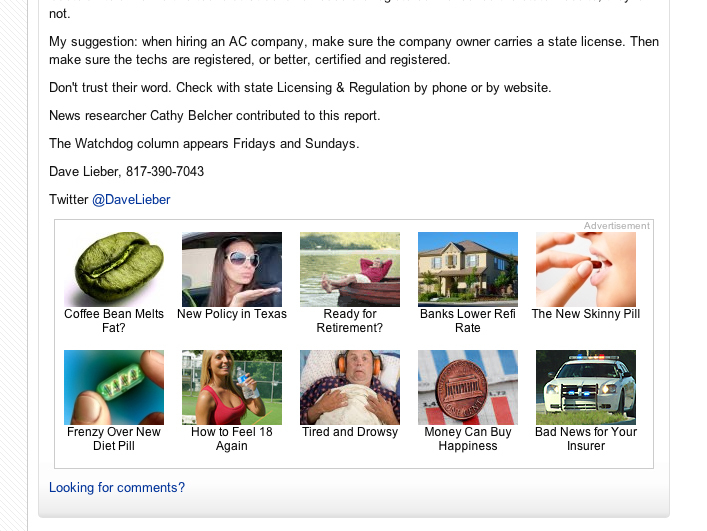 I am sure I missed a few, but these are some of the main ways I see Star-Telegram monetizing the site. I would also like to point out that the Star-Telegram has a network of sites, so they are using these same techniques throughout every site in their network. For example, check out DFW.com. Overall, the strategy they have in place is decent. I am extremely displeased with the ways they displays ads and sponsored content/ads, but obviously it is working for them.. The ad placements, the number of ads, and the type of ads could all be getting A/B tested as I write this post as well. Before we get into some of the strategies I would put in place and test on Star-Telegram.com, I want to say this is an outsider looking in. There could be technical staff limitations or very good reasoning behind all of their decisions. I think some things should still be done differently, so here we go! If you have done any type of internet marketing research you will stumble across this concept over and over. This is saying there is huge value in building a targeted email list! I am actually really surprised that the site isn’t building an email list. Not only would this be another way to generate income for the site, but it would also be another traffic source. The list would be extremely powerful in the DFW area! Why? Because the individuals on this list would more than likely live in the DFW area. Think of all the different ways this could benefit the Star-Telegram. Send out their affiliate links to daily deals. How about a weekly aggregate of all the local daily deals like groupon, livingsocial, yahoo deals, blah, blah, blah. Now if you are a digital marketer reading this, you are thinking “yeah, just spam them with more ads and sponsored content, that will really have a high open rate!” And you are right, they won’t build a successful email list just sending out ads and sponsored content over and over. Like almost everything else online, it will be providing value to keep them opening the emails. There are tons of email campaigns that make a profit from their email list through affiliate links and ads. Take for example, NextDraft and Now I Know. They have a huge following and active email list because that’s right, they provide value. I personally read every email they send out and every email also includes some sort of advertisement. Doesn’t keep me from opening it and clicking the links and relevant ads they provide. So how would Star-Telegram pull this off? First of all, they need an email signup on their website. If it was me, I would put it in the top of the right sidebar and maybe even after each individual article. Now you can’t just put a text field with that button that says “Enter your email PLEASE!” There has to be a strong call to action (CTA) that the visitor wants. In my experience, the best CTA for an email signup is a FREE offer or some sort of discount. This of course depends on the site. Since we are talking about Star-Telegram lets think of a couple strategies we could use to build an email list. Lets keep in mind the people visiting the website live, work, and play around the DFW area, so we need to offer something that would spark the interests of these individuals. The top 5-10 stories of the day/week straight to your inbox. These are just some examples I just pulled out of thin air, but you get the idea. There are also strategies of what to send after they register and how often to send out emails, but that gets into a different can of worms. My point(novel) here is to express how important an email list is for a company like the Star-Telegram and how they can benefit. Once they have a strong list with outstanding open rates, they can then think of different ways that best fits their business model to monetize the list. But remember: Each email needs to provide VALUE! Don’t just send out emails with nonsense. This technique isn’t earth shattering, but I think it could really drive leads to local business owners and at the same time generate revenue for the Star-Telegram. When skimming the Star-Telegram website, I stumbled across an article titled “How to find a reliable air conditioning company” that was linked from the homepage. Why not list some local, reliable air conditioning companies for the readers of this article to contact? The Star-Telegram could monetize this type of article several different ways. Setup a unique telephone number that tracks calls. Star-Telegram could charge per lead/call. Just charge a fee to list the local air conditioning company in the article. This way the Star-Telegram doesn’t have to worry about tracking or charging per lead. Track links to the, in this case, air conditioning companies websites that are linked in this article and charge for the traffic. My answer to that is look at the bottom of the above screenshot of the article. You will notice ads that say things like “Find local Top-Rated Heating Pros in your area.” These ads from a third party(Yahoo) are doing just want I am explaining. The only difference is Star-Telgram is probably only getting a few CENTS per click on these ads. If the Star-Telegram creates a program to get local business owners listed on related articles they could charge a premium. I hope you realize the value and the potential income that could be generated with this technique. A local Fort Worth homeowner is having air conditioning problems. He/She gets on the internet and searches for a ‘reliable air conditioning company’ and in the search engine listings they see an article on the Star-Telegram(a reliable news source). They click the link and read the article. At the end of this article they notice some links to some reliable air conditioning companies that the author of the article recommends. BOOM, the homeowner clicks the link or calls the number and a lead is generated. Star-Telegram gets paid for the lead and you now have a satisfied local homeowner and local business owner. This brings up my next point, relevant ads. The ads that the Star-Telegram recommends are HORRIBLE. Look at the image below. These ads are from the same article we were discussing in the previous section, “How to find a reliable air conditioning company.” Check out those ads! They don’t relate to the article at all. The only type of visitors I can think of clicking these type of ads are just bored visitors looking to kill some time. Again, the visitor that is reading this article is looking for information about air condition companies. So lets give that to them. In this case, I would remove these ads and get my programmers to develop/insert a widget that pulls in other related news/articles that relate to the article they are reading. This will increase visitors time on site and page views, which is a big plus for paid advertisers that are looking at the Star-Telegram. When looking at a network of sites that is owned by the second largest newspaper company in the United States, I wonder why they don’t own/run their own ad network? I wrote this article back in 2013 but never finished it for some reason. Most, if not all the content in this article is still relevant. 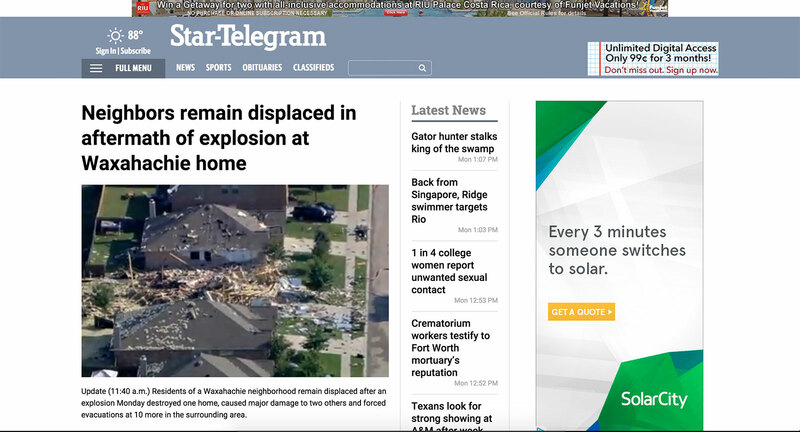 Since I first started this article, it looks like the Star-Telegram has done a site redesign..
Not really sure how I feel about it. Check out the main menu drop down, then head over to the NY Times and click “Sections” in the top left. Similar, but the UX on Star-Telgram is not so good compared to the NY Times.. Anyway, feel free to share your thoughts in the comments below.